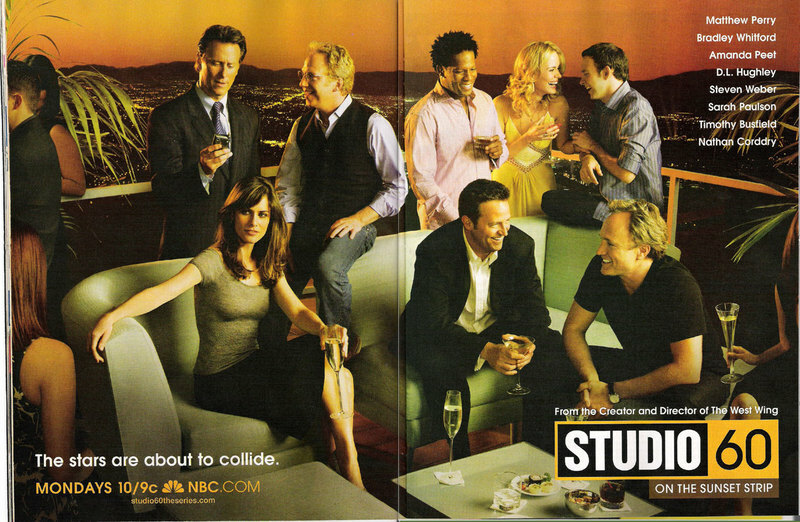 If there’s one new show I’ll try to watch this fall, it’s NBC’s Studio 60 on the Sunset Strip. This kind of anticipation, though, is in spite of the show’s ad campaign, at least according to Kate over at Market My Monkey. First, she posted about the giant looming heads of Bradley Whitford, Matthew Perry and Amanda Peet glaring down at her on Sunset. Now she takes on this print ad, which she says “is generous enough to provide me with everything I hate about the entire campaign in one foul swoop.” Her major peeves: the tagline, “The stars are about to collide” (“What stars?” she asks), and the apparent disregard for Timothy Busfield’s safety, concern for which may be a first. The campaign is perhaps overly glossy and larger than life. But no doubt NBC, which is paying a reported $3 million per episode for the program, wouldn’t have it any other way. If you can’t wait until next Monday for the premiere, watch it online here.